One of the last bargain V7 III Stones, our dealer demo with 526 miles. GENUINE ITALIAN MASTERPIECE - 6sp, ABS+TC, 6gal STEEL TANK, no muss no fuss SHAFT DRIVE and AIR COOLED, yet LIGHTWEIGHT and easy handling... REAL V-TWIN CHARACTER! The Moto Guzzi V7 III Stone now has a stronger and more personal aesthetic connotation than it ever had before. Eclectic and essential, it foregoes any chrome parts, embracing the darkness of its matte black paintwork. The total "dark matte" look characterizes the V7 III and distinguishes it. The V7 III Stone arrives with alloy wheels wheels and single circular display instrumentation. 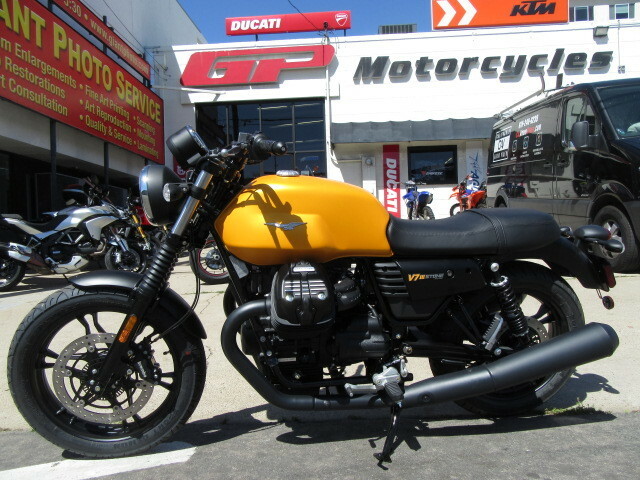 OPTIONAL Moto Guzzi Multi Media Platform. MG-MP is the innovative multimedia system to connect the bike to your smartphone. Was $7,990. Price includes all mfg. incentives.